Synopsis: JD wants to know how Four Croners got its name. It was a bright autumn morning when JD Dunne walked into the saloon and glanced around, wondering where the rest of the peacekeepers were. Ezra was the only one there, and he was playing cards with two of the passengers who had arrived on yesterday's stage. The young sheriff grinned. The two men were probably going to lose their stakes to the gambler before the stage pulled out in another hour or so. JD leaned against the bar and waited for the bartender to finish with a cowboy at the far end before he asked for some coffee. Then, sipping the too-bitter brew, he exhaled loudly and tried to remember if the others had said anything about where they might be this morning, but nothing specific came to mind. Well, he considered, it was rather early for Buck to be up and around, and Nathan and Josiah probably wouldn't arrive for breakfast for another hour or so. Vin was probably out on patrol, and no one ever knew exactly where Chris was. The time passed slowly, and JD's thoughts wandered until he turned back to check on Ezra and found the man sitting at the table alone, playing solitaire. He walked over and sat down without an invitation. The gambler looked up, saying, "I couldn't help but notice that you seemed to be lost in some mental machinations of considerable import." "Huh?" JD responded, looking confused. Leave it to Ezra to start the day with a bevy of five dollar words tossed in his direction. Ezra sighed and rolled his eyes. "It appeared that you were lost in thought earlier." bored, I guess. But then I got to thinking and Ezra, do you know why they named this place Four Corners?" "I assure you, my young friend, I have no earthly clue. If you ask me, they should have just applied the moniker of 'Hell' and been done with it." "Seems kind of strange, don't you think? I mean, there's a whole section of this region that's called 'four corners,' but that's several days ride from here." Ezra glanced over at the young man, realizing that he was getting worked up over the trivial question, and the last thing he wanted this morning was JD running off at the mouth about nothing. "Why don't you seek out Mr. Jackson and ask him to enlighten you?" he suggested. "He has resided in this pitiable excuse for civilization for a considerable period of time." JD nodded. "You're right! I'll bet he does know. Do you know where he is?" "I would suggest you begin your quest at the clinic," Ezra told him. JD nodded and set his coffee cup down. He stood, promising, "When I find out, I'll come back and tell you," before heading for the door. Ezra watched him leave, muttering, "I'm sure I won't possibly endure the wait for that bit of scintillating revelation." JD hurried up the steps to the clinic, taking them two at a time. He stopped for a moment on the landing to catch his breath, then walked to the door and lifted his hand to knock, but the door opened before he could. Nathan's eyes rounded with surprise. "JD, ya all right?" he asked, immediately concerned at seeing the young man so early in the morning. "I'm fine, Nathan," JD replied. "I just have a question I wanted to ask you." "I've got t' get over to the Potter's. Edward's come down with a fever. Can ya ask me on the way over there?" "Sure," JD said, following the healer down the stairs and then hurrying to catch up and walk beside the man as he hurried to the shopkeeper's home. "So, what is it you wanted t' ask me?" Nathan prompted him. "Well, I was just wondering, do you know why they named Four Corners Four Corners? Seems kind of strange, don't you think? I mean, there being a whole section of the Territory that's called 'four corners,' but that's several days ride from here." Jackson pace slowed just slightly, his brow furrowing. "Ya know, don't think I ever did know the answer t' that. Never thought t' ask, either, t' be honest." "Oh. That's too bad," the young sheriff replied, looking disappointed. "Have you asked Josiah?" Nathan questioned. "He hears a lot 'a stuff from folks, and he likes stories. He might've heard how the town got its name." JD smiled. "Yeah, I'll bet you're right! I'll do that! Do you know where he is?" Nathan shrugged. "Guess you might want to check at the church first. Heard him say yesterday that he wanted to replace some of the floorboards before somebody fell clean through while standing on 'em." "I'll do that. Thanks, Nathan!" JD said, veering off and heading back toward the church. Nathan tuned, watching him go, then shook his head and continued on to the Potter's, muttering, "Where do he come up with these questions, Lord? Guess y' better warn Josiah he's comin'." or find me a little help." "Mornin', Josiah," JD called as he stepped inside the church. The big man glanced over his shoulder and smiled broadly. "Good morning, JD. You're the answer to my prayer. Want to lend me a hand?" JD dipped his head and shifted his weight from foot to foot as he said, "Well, no, not exactly. You see, I asked Ezra this question and he didn't know the answer, so he told me to go ask Nathan, and he didn't know the answer either, but he thought you might." The preacher's eyes rounded just slightly. "I see. And what is this question that's got you out and about so early this morning?" "Josiah, do you know why they call Four Corners Four Corners? Don't it seem kind of strange? What with there being a whole section of the Territory already called 'four corners'?" Josiah's brow wrinkled and he frowned, thinking. JD waited. Then the preacher shook his head and said, "That's a real interesting question you have there, brother, but, as with so many things, I have no answer for you." "Oh," JD replied, his expression shifting from hopeful to disappointed. "Maybe you should talk to brother Vin. He's familiar with the Territory. Maybe he's heard tell how that came to pass." JD brightened again. "Yeah! I'll bet you're right! Vin knows a lot of stuff about a lot of things  more than a lot of folks give him credit for. You ever notice that? Do you know where he is?" Josiah shook his head, grinning, but said, "Given the time of day, though, you might try to catch him at the livery. He had the night patrol and should be coming in any time now." "Right. Okay," JD said, turning and hurrying for the door. "You're sure you don't want to stay and help me for a while?" Josiah called hopefully after him. "I'll see y' later, Josiah!" JD called back, disappearing. "That's what they all say," the preacher commented mournfully before he returned to his work. "Vin! Hey, Vin!" JD called, glad that he'd caught Tanner before the tracker disappeared into his wagon for some much-needed sleep. Tanner dumped a portion of grain into a bucket for his horse, then turned, asking, "What's wrong, JD?" The young sheriff stopped short and glanced around, looking a little confused. "Uh, nothing's wrong, Vin. I'm just glad I caught you before you headed off to bed, that's all." "Y' didn't, I'm already headed that way," Tanner said, starting out of the livery, the young sheriff on his heels. "Well, I'll just walk along with you  as far as your wagon," JD said, smiling. "I've got a question I need to ask you." "What kind 'a question?" the tracker asked suspiciously as they continued along the boardwalk. "Well, I already asked Ezra, and he didn't know  which kind of surprised me, come to think about it  and he told me to ask Nathan. But Nathan didn't know either, and he told me to ask Josiah, but Josiah didn't know  which really surprised me, because he knows a lot more than I expect him to know, being a preacher and all  but he thought you might know, so I came to ask you before you went to bed." Vin stopped and stared at the young man. "Y' want t' try that again, kid, and this time in some language I c'n understand?" JD's eyes rounded slightly. "Uh, I just wanted to know if you knew why they call Four Corners Four Corners, that's all. Seems kind of strange, what with that whole section of the region being called 'four corners' too." Vin stood for a moment, sorting through the young man's words. "Reckon yer askin' why they saddled this here place with a name like Four Corners when it ain't nowhere close to the real four corners." JD nodded, saying, "Yeah! So you do know why?" "Hell, never understood it m'self, kid," Vin replied, heading for his wagon again. "You're sure?" JD asked hopefully. "I mean, you know a lot of stuff and"
"Why don't y' ask Chris. He used t' live in these parts. He might 'a heard tell why that is." "Hey, you're right! Do you know where he is?" "Hell, kid, just wait at the saloon," Vin said with a grin. "He'll be along shortly." JD grinned. "I'll do that. And thanks, Vin!" And with that he was jogging off toward the saloon. Vin watched him, shaking his head. "Kid's got too damned much gumption fer this time 'a day." JD burst into the saloon, a little breathless, but he was pleased to see that Chris was already seated at his usual table in the back, working on a cup of coffee. Ezra, however, was gone. The young sheriff hurried over to the table and plopped into a chair, still panting slightly. Larabee looked up at the young man, asking, "Trouble?" JD shook his head. "Just wanted to ask you a question. I already asked Ezra, but he told me to ask Nathan, and he told me to asked Josiah, and he didn't know and told me to ask Vin, but Vin didn't know either! He said I should ask you." Larabee blinked, trying to decide if he wanted to bother figuring that out. He decided he didn't. Besides, he'd heard the important part  Vin had sent JD to him. "He did, did he?" he asked softly, contemplating what kind of revenge might be called for. "Yep. He thought you might know why they call Four Corners Four Corners. Don't it seem strange to you?" Chris took a deep breath, hesitated for a moment, then shook his head and said, "Don't know. Don't care." "Oh," JD said, his expression falling. Larabee sighed softly, unable to tolerate having put that look on the boy's face. "Look, JD, why don't you ask Buck? He picks up a lot of stup interesting stuff like that from his, uh, lady friends." The excitement returned to JD's expression. "Hey, you're right! Hell, if anybody would know it'd be Buck! Do you know where he is?" "Saw him heading to the bath house a while ago. He's probably still there." JD pushed to his feet. "Thanks, Chris!" he said and then he was heading for the batwing doors. Larabee just shook his head and went back to his coffee. Buck's eyes were squeezed closed, his face a mask of soapy lather when JD burst into the bath house. The ladies' man continued to scrub until the young sheriff sat down on the stool next to the tub, saying, "Hi, Buck!" Wilmington yelped and dunked his head, coming up a moment later, wiping water off of his face. "JD!" he bellowed. "How many times do I have t' tell y', son, you don't come sneakin' up on a man like that!" "I wasn't sneaking. I was walking and talking just like normal. I want to ask you a question. Ezra didn't know, and Nathan didn't know, and neither did Josiah, or Vin or Chris, but he told me to ask you." "Whoa, hold on there, pard," Buck said, holding up his dripping hands, "you've got t' slow down some. You're goin' t' bust a gut you keep that up." JD sighed and rolled his eyes. "Guess that means you don't know either." "Well, I don't know if I do or I don't. You ain't asked me the question yet! So, what's this all-fired important question you've got anyway?" "Why did they name Four Corners Four Corners?" Buck nodded thoughtfully. "You know, I've wondered 'bout that myself," he said, his voice soft and considering. Then he grinned and said, "But it never bothered me so much I had to find me an answer. But I'll betcha I know somebody who does know, though." "Well, it ain't Ezra, Nathan, Josiah, Vin, Chris or you, I can tell you that for sure." The ladies' man rolled his eyes. "I'll betcha a beer that Mary Travis knows, or she's got the answer tucked away in those files of hers and her late husband's." JD's eyes rounded. "I'll bet you're right! Thanks, Buck!" "Don't forget to come buy me that beer, kid!" he called after the young sheriff as JD bolted out of the bath house. He chuckled and shook his head, wondering what in the world had set the kid off on that particular quest, especially so early in the morning. JD stepped into the Clarion office and yanked his hat off. "Uh, morning, Mrs. Travis. Are you busy?" She turned, smiling at him. "Good morning, JD. Can I help you with something?" "I sure hope so," he said and sighed heavily. " I've already asked Ezra and Nathan and Josiah and Vin and Chris and Buck and none of them could tell me." "Oh?" Mary replied, becoming a little nervous. "And all I want to know was why they named Four Corners Four Corners. 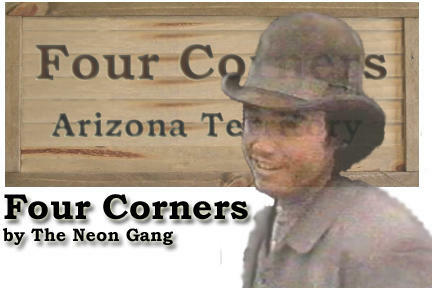 I mean, it seems kind of strange to me, what with a whole section of the territory already being called 'four corners,' but that area's several days ride from here, so why'd they name this place after that place if this place isn't in that place?" She smiled, hoping her relief wasn't too evident. "Oh. Is that all?" "Can you tell me?" he implored her. "Yes, I can." She motioned for him to take a seat and he slid into a chair on the far side of her desk, sitting on the edge, his attention focused on her. She sat down as well, folded her hands on the desktop, and said, "Well, you have to understand, the first settlers here were the Thomas family. They ran a waystation for traders coming up from Old Mexico, heading to Tucson. Because they were here, other traders  and then the stage going from New Mexico Territory to California  began to stop here as well. With people passing through on a fairly regular basis, and with several large ranches coming into the area, a few businesses sprang up around the waystation  which, by the way, burned down several years ago; the livery's built on the site now. The first was the saloon, then the Potters store, and the café, then the first hotel. I think the hardware store was next, and then Ming settled here and opened the laundry. Well, in any case, before long there was a small town here, but it didn't have a name. Folks referred to it as Thomas' Crossing, or Thomas' Station. "'Four Corners, huh?' the driver replied, and the name stuck." Mary grinned. "Well, it's true we're not Tombstone, I'll grant you that, but we have a nice little community here, Sheriff, and it's getting nicer all the time." JD nodded, but he was still frowning. "Uh, thanks, Mrs. Travis." "Glad I could help," she replied, standing as he did and escorting him to the door. JD stepped out onto the boardwalk and glanced around. Then he smiled. "I guess having four sturdy corners in this town is a blessing," he commented. Mary smiled as well as she closed the door, adding softly, "So is having seven handsome peacekeepers." JD found the other peacekeepers, except Vin, in the saloon and walked over to join them, deciding that having friends like these men was an even bigger blessing. "So, I betcha ya owe me a beer, don'tcha, kid?" Buck asked smugly. JD sighed. "Yes, Buck, I owe you a beer." "I told ya Mary would know!" the ladies' man crowed. "So, you found an answer to yo'r question?" Nathan asked the young sheriff. JD nodded. "Mrs. Travis knew why Four Corners is called Four Corners." "Well, pray share this monumental bit of new knowledge with us, Mr. Dunne. I'm sure we are all breathless with anticipation," Ezra said a few moments later when JD didn't just up and tell them. "I have to admit, my curiosity's beginning to itch," Josiah offered by way of an inducement. JD grinned. "Well, I can tell you this, it wasn't nearly as interesting as I was hoping it would be," he admitted and then told them the story Mary had told him. "Guess that's as good a reason as any," Chris concluded.